Equipped with Projection Function:180-degree swivel projection guarantee that you need not view time from clock display,Project ultra-clear time onto your walls or ceiling when you wake up to easily read time in your full view. Digital AM/FM Radio:The AM/FM tuner lets you choose from the wide range of free music, talk shows, sports,tories,morning talking,podcast,weather forecast,traffic and other programming. Easily switch from AM to FM as you need. 1.8 Inch Ultra-Large Display:Mesqool Red LED display is easy to read from anywhere in the whole house,can also operate brightness settings to adjust the display to fit for your personal preference. High-speed USB charging compatible with all smartphones,tablets,mobile phones & mp3 players.This product features convenient dual alarms,Each alarm function could be set independently,wake to buzzer or radio. 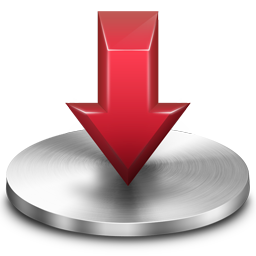 High-Low Dimmer/Dimmest Switch: to Adjust proper brightness as you desire,once you go to bed,you could switch the display brightness from High-Medium-Low. Exactly what I was looking for. Primary goals at purchasing this product was the ability to dim the clock down to a reasonable, non-night light mode. Good gawd some of the clocks are way too bright for my taste. This clock has 3 levels of brightness. The lowest level was perfect. But the projection feature was the BEST feature of this clock. I have textured ceilings and I am near-sighted and I was not sure if this clock would do the trick or not. It passed with flying colors! The numbers and AM/PM projected onto the textured ceiling and both my wife (also near-sighted) and I could easily read the time on the ceiling. You can rotate the projection 180 degrees as well, so if you put the clock at the foot of your bed the numbers will be right side up. We have the clock on our head board. It comes with an AC adapter. Also has a standard USB connection (like you have on your computer) on it for a charging cable of your choice (not supplied). There is a DST toggle which will move the hour forward or backward so you do not have to dink with the time at all! An alarm and an FM radio, neither of which I have tested. I highly recommend this clock. Good radio, Projector is great, Speakers are good, Customer (me, heh) is very satisfied; would buy again. I got this clock for two reasons - the first being the size of the numbers, and the second being the projection. The projection was a bit of a curiosity for me, but it sounded useful. Now that it's set up, I find that I end up using the projector readout more than the actual clock face! There is a button to switch the orientation of the projection (180 degrees) and you can turn a knob around the lens to focus it. It also pivots, as shown in the photo. I have it on the ceiling over the bed so if I wake up I can see the time easily - very important, due to medical issues. As an aside, the clock-face is bright enough to be clear to read, but not eye-searing. It comes with a wire antenna for the radio feature, so you will likely need something for it to wrap around, or otherwise secure it appropriately. The speakers are also good quality, esp. for a radio. All in all, I would buy this again - wonderful clock. My favorite Digital Alarm Clock I ever owned. First I want to say that I've been looking for a decent alarm clock for a while now. I don't know how many I have owned over the years? But most leave you wanting more and just don't live up to the features that the clock has. I always seem to end up throwing my clocks in the trash after no time at all. 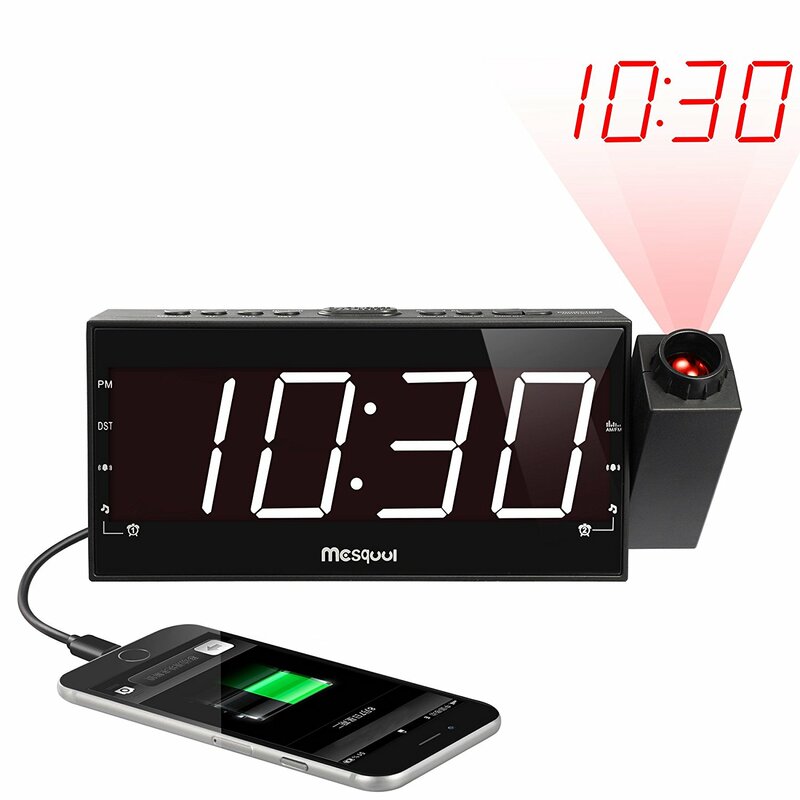 I stumbled on Mesqool's AM/FM Digital Dimmable Projection Duel Alarm Clock. And right from the beginning from the packaging I knew id be very pleased with this product. I have always wanted a clock that would project the time on the ceiling or wall so I wouldn't have to turn over and try to look at my normal alarm clock. . Like I said my favorite part is the 180-degree swivel projection guarantee that you need not view time from clock display Projects ultra-clear time onto your walls or ceiling when you wake up to easily read time in your full view. You can set the brightness to any that you desire from low-medium-high. Also you have a AM/FM radio built right into this awesome out of this world digital alarm clock. So if you want to wake up to your favorite radio station you are good to go from the start. I love how I can charge my phone or IPOD with the built in USB plug in, what else do you need with a clock? Wait there is more that I love about Mesqool's Digital Projection Alarm Clock. You have a duel alarm for you and your spouse, roommate, sibling, etc. The display is beyond bright and you will have no problems seeing the time no matter where you are in the room. Great clock. You can make the numbers larger or smaller depending on how far you project the light. It is easy to read and as long as it is mostly dark you can see the numbers fine. It does NOT work if there is much light in a room. But I got it for night in the bedroom so works perfect for that. Love this little clock and would highly recommend it! PROJECTOR IS A LATE NIGHT ATTITUDE STOPPER! This light is so totally cool! I love it. Everyone uses their phones for the most part now a days but this clock looks cool and is awesome. I bought it for my son, but made the mistake of trying it out and now I need to find a different one for him. I love the projection on the ceiling. I just look up and can see the time. I keep my room dark so sometimes in the morning I can't tell what time it is and go back to sleep and now with this I won't over sleep anymore. I do not like alarms so have not used this feature. This also charges my phone and now I do not need to worry about the extra outlet. I recommend this clock! it also has a dimmer for those that hate light. This is a must have , I love waking up & seeing the time on the ceiling. big purchase from amazon so far. so useful. can't always see the time any time of the time, with or without glasses; yet not intrusive. Bought for Christmas present for wife. She and I love this. Ceiling view of the time when a wife has a baby in bed (nursing) and a she has not so great eyesight...perfect. I really like the USB charger. Good clock projection. Had a little trouble setting time. Watched video link sent to me by Amazon Service. Instruction manual says press and hold set button. As soon as the time flashed you should release button. Then you use hours and minutes button to set time. Very easy clock and radio to use. Dimmer is a great feature. I was looking for an alarm clock that won't bother me when I go to sleep. I used to have one that has the night light but was too bright in the dark and disturbed my sleep. I was not sure about this one at first, after I read some reviews and decided to buy it. It works really well, the font is big enough that I could read it without my contact lens, the light may still be a bit bright but if I slightly turned it away from my bed, it works fine. Another good aspect is the projection feature which you could project the time on to the ceiling or a wall which allows you to find the time without turning or rolling over the other person. A: It does not play music from your phone through the alarm clock's speakers, you can play music through your phone's speakers while using the USB port on the alarm clock to charge your phone. WHEN i unplug it from electricity , the time changed to the default , why and how to make it keeping the time i've adjusted for ? Can this be set to go off only on certain days? ex. week days only. A: I don't think so. You can only set it for time, not the date or day of the week, and there are no instructions for setting it to go off only on certain days. Is this an Atomic Clock? Will it automatically reset the time after a power failure? A: It has batteries to keep the time but it will not sync to an external clock via radio (some people call these atomic clocks, but only the sender is connected to an atomic clock), so you have to set the time yourself for the first time and whenever it goes out of sync.